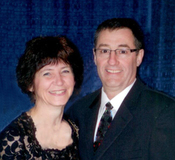 Pierre and Barb Charpentier co-owners of Shanidar Funeral Services and their staff are here to serve the west-central area of Saskatchewan. Pierre has over thirty-one years of funeral service experience, twenty of those years as a manager. He began his career apprenticing with Gary Nickell at Clements' Rosetown Funeral Home in 1985. He received his Funeral Director and Embalmer Licence in 1988 and his Prepaid Sales Licence in 1989. He was then employed with a public corporation as funeral home manager at Shellbrook/Spiritwood, and Unity returning to Rosetown in 2000 to manage Clements'. Although he left active funeral service for a year and half, he continued as a mentor and practical embalming examiner in the education process of new licensee's in the province. In October of 2010 he returned to funeral service to assist those in need. With the opening of Shanidar Funeral Services, Pierre realized a life-long dream to own a funeral home. With his extensive knowledge of funeral service, Pierre is qualified to answer all of your questions and assist you in planning the appropriate commemoration for your loved one. The numerous notes of gratitude and appreciation over the years is a testament to the care extended to the families he serves. Barbara is a Registered Nurse as well as Licensed Funeral Director. She was born and raised in Rosetown then went to school in Edmonton. She worked as an R.N. in Kindersley, Shellbrook, Prince Albert and Rosetown and began working in funeral service alongside her husband Pierre in 1997. With her background as a registered nurse and full time mother of six she also has a wealth of knowledge in assisting families in the loss of their loved ones. She has received many thanks from those she has served in funeral service and nursing. She is also currently employed at Rosetown Hospital. The staff of Shanidar are committed to assist wherever is necessary in providing unparalleled service to the families they serve. "We are here because we care." Amanda Starosta was born and raised in Saskatoon, after completing high school, she attended SIAST-Kelsey Campus and obtained her Funeral Director/Embalmer certificates. She moved to Rosetown in January 2007 and while working for Clements Rosetown Funeral Home, she obtained her Funeral Director and Embalmer licenses in February 2008. Amanda took a brief hiatus from funeral service during which she was employed with Prairie Centre Credit Union in Rosetown and happily returned to funeral service joining the Shanidar Funeral Services team in June of 2016.